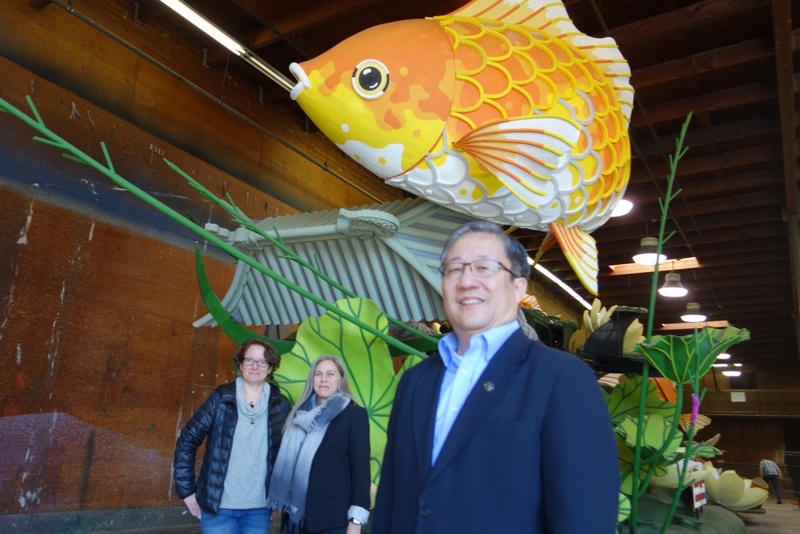 William Chu, CFO of real estate company Singpoli, stands with the company's 2018 Rose Parade float. Behind him are Gwen Robertson of Paradiso Parade Floats, left, and Petra Wennberg Cesario, partner and co-founder of Interactivism, which designed the augmented reality experience for the float. Rose Parade float designers work each year to out-do each other with new features to wow the audience. Last year, the parade's heaviest-ever float featured surfing dogs that stole the show. For Monday's 2018 parade, the big innovation could be augmented reality. Augmented reality is the same technology that made Pokemon Go so popular. With a downloaded app, such characters as Pikachu appear on your phone as if they are part of the real-life scene in front of you. For the first time in the Rose Parade, augmented reality will be used for a float, making a gigantic fish appear to leap a gate 35 feet high before transforming into a dragon. The float is sponsored by Singpoli, an Arcadia real estate development company and built by Paradiso Parade Floats. The Singpoli/Paradiso collaboration has taken many top Tournament of Roses awards in the past four years, with flying horses and a fire-breathing dragon among the previous creations. This year's addition of augmented reality takes the parade floats in a new, digital direction. The technology depicts "a fish swimming upstream against adversity," said Singpoli CFO William Chu. He described a traditional Chinese tale of struggle in which some fish don't survive, but those that do, turn into dragons. The decorations on the float, while animated to show the big fish moving their tails and fins, do not actually transform in real life. Parade-goers who download the augmented reality app from www.singpoliAR.com will get an alert as the leaping fish float approaches. Viewing the float through the phone app, a fish will appear to transform into a floral dragon. The app will also work when viewing the Singpoli float after the parade or while watching the parade on TV — however, in those cases, there is no alert; viewers just use the app to see the transformation. The story of a fish transforming into a dragon is symbolic of the Southern California immigrant experience, Chu said. "This is an opportunity to depict working and overcoming difficulties and some become a dragon, which is a symbol of success in the Chinese culture," he said. Viewers can actually take selfies with the animated characters as they are superimposed on the float, said Petra Wennberg Cesario, partner and co-founder of Interactivism, a digital product design agency in Pasadena. She was on the tech team that created the augmented reality experience for the float. The parade gets underway at 8 a.m. and will be televised live on several local TV channels. 100 Rose Queens later, are they still relevant?